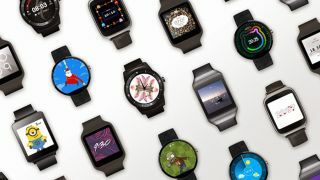 A new Android Wear update adds official support for interactive watch faces, allowing for even more at-a-glance information for you to digest on your smartwatch. Now, it can really show off its smarts. The update brings with it a whole lot of possibilities for the interactive watch faces of tomorrow. But Google has plenty to choose from right now. Under Armour's interactive watch face, for example, puts fitness info front and center. This will be perfect for folks who use their Android Wear devices mostly for working out, tracking steps and watching the calories burn away. Bits (seen below) is one that's a little more of a practical choice for everyone. It stylishly displays general information like the weather, calendar appointments, the date, e-mails and, of course, the time. Strangely, the name of the update to Android's watch OS is nowhere to be found on the announcement page. It's no ground-shaking discovery, but the name Android Wear "v1.3" appears on the Bits app page. The update is rolling out today, but should be widely available, according to Google, in the coming weeks.